Electricity is produced at a variety of places such as power plants, hydroelectric dams, wind turbines and solar panels. These locations generate tiny particles, electrons, and move them from where the electricity is being produced to where it is being used – the electrical current. This electrical current gravitates to the ground for a continuous flow and will go through whatever it needs to, to reach the ground… even humans. 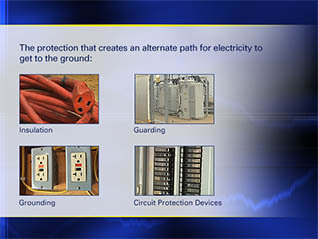 The training course, “Electrical Safety: What Everyone Should Know,” explains vital information to instill in your employees regarding electricity and its hazards. Human bodies are conductive because we generate electricity. Extra current into the body can cause harm not only externally but also by disrupting the rhythm of the heart, muscle spasms, paralysis in diaphragm and chest, and burn internal organs and tissues. The extent of an injury greatly depends upon the amount of current, length of time it occurs in the body and where the current enters and exits the body. 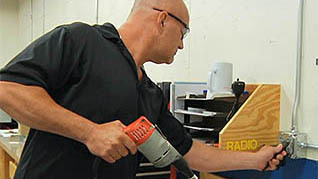 Making your employees aware of hazards and precautions for electrical safety are essential for a safe work environment. This entry was posted in Workplace Health and Safety, Workplace Training and tagged basic electrical safety, electrical safety, electrical safety training, electricity. Bookmark the permalink.